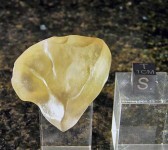 Please visit our site to see our Libyan Desert Glass. Libyan Desert Glass is generally yellow in color but can be very clear or milky and bubbly light yellow. Some fragments have dark bands and swirls of brownish material. It is in these dark areas that some of the melted comic body is believed by some to be preserved. Libyan Desert Glass was used in ancient times as a gem stone for the Pharaohs and remains a highly prized impact glass for collectors today. 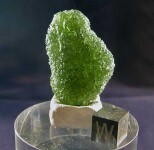 Moldavite tektites are found in an area called the Central European strewnfield. Moldavites are green over most of the dispersed strewnfield though rare brown types are found in some areas. All of our Moldavite Jewelry is handmade with beautiful specimens of moldavite tektite. Each moldavite pendant is unique and will never look exactly like another. Please visit our website to see more. Our online store has Bediasite Tektites For Sale. Bediasite tektites are found in a small region of eastern Texas. As increased exploration has been done for them the area in which they are found has grown eastward. They are generally a very dark black color and often a little abraded from natural weathering. 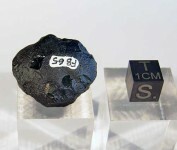 Many of our specimens are labeled specimens from the Darryl Futrell Collection of Tektites.